A new variety, raised by the Institute of Horticultural Research, East Malling. Concorde is a superb, very heavy cropping variety, with a flavour to match the quality of the fruits. Raised from a cross between Conference and Doyenne du Comice, Concorde has inherited the reliability and easy growth of Conference with the influence of Doyenne to give a beautiful flavour. The fruits are medium to large, light green turning pale yellow as they ripen. The sweet. juicy flesh has a very good texture. Concorde is even more precious in its cropping than its parent, Conference. In trials at the National Fruit Trials, Brogdale. the yield has been nearly double that of its parents, Conference and Doyenne. More impressive is the quality of the fruit. 80% have been graded Class 1. The fruits are ready for picking late October and store well until January. With its very heavy yield, superb quality and beautiful flavour, Concorde is, without doubt, a perfect garden variety. Pollinate with: Conference, Williams or Doyenne du Comice. Concorde is, itself, a very good pollinator for other varieties. Very highly recommended. Makes an ideal compact tree. Probably only 7' tall after 5 years. Concorde is now proving self fertile setting a good crop on its own. 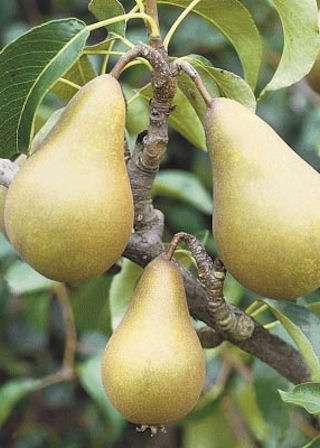 This versatile pear variety is suitable for all uses owing to it's capacity to be grown as most standard methods. As a bush tree the smallest rootstock is Quince C. This compact rootstock can be maintained quite easily at a modest 6-8'. The spread is the same as the height of the tree so where planting multiple trees allow not less than 8' between them. Crops of 30ib plus on an established tree are normal. Suits most good soils. You can also consider growing this variety as a Supercolumn; such trees are compact slender spire-like specimens which are very easy to prune and accomodate, needing only about 24" in which to grow. Crops appear all up the main stem, 10ib or more per tree is a good average. Why not consider growing Concorde in combination with other supercolumn trees - all varieties of apple, pear, plum, gage & damson are available. Concorde on Quince 'A' rootstock is recommended and can suit lawn, grassland or orchard setting. It matures to approximately 10-14' depending on pruning & again the spread is the same as the height of the tree. Heavy cropping and more tolerant of poorer soils. Crops of 30ib+ on established trees can be expected. BA29 is used primarily for paddock and grassland or for where a large traditional tree us required. Very hardy and durable trees, cropping is a little later than other rootstocks, crops of 40ib or more but difficult to harvest without a ladder. Concorde can also be utilized as an edging tree via the stepover option. With a top height of just 18" this truly is a tree you can 'step over' Plant 5' apart. An ornamental addition to the kitchen garden or allotment. You will need a top wire to train the top laterals down to. We recommend Concorde on the small bush rootstock Quince C, or as a supercolumn which is also very suited to pot growing. So no matter what your circumstances you can enjoy this wonderful Pear tree in your garden. Self fertile blossom; no need for a pollinator. NATURALLY COMPACT Needs little pruning. HARDY & suited to most areas of the country. GOOD SWEET FLAVOUR Crisp at first but becoming tender later on. SEASON Late September & into October. PLANTING can commence at any time of year; Autumn-Spring as bare-root is a very good time. But planting during the growing season is perfectly possible from container grown stock.